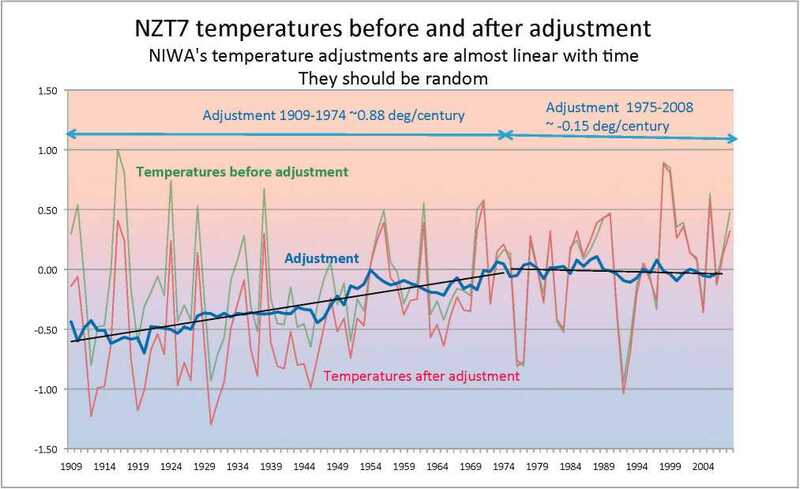 The NZT7 is represented by a graph covering the 100-year period 1910-2010, and aims to measure the temperature trend (in °C/century) during that period. Such a trend will be more pronounced as a result of either downward adjustments in the first part of the period (2010-75) or upward adjustments towards the end. The impact of an adjustment is determined by its size and the number of years it is applied. The NZ Climate Science Coalition has listed the NIWA changes in a ‘NZT7 Schedule of Adjustments’ available from this site. (You can download the raw data in a spreadsheet (27 KB) or a pdf (13 KB).) The Coalition has quantified each adjustment and identified whether it has a favourable or unfavourable effect on the NIWA hypothesis that temperatures warmed throughout the last 100 years. In all seven stations, the adjustments created or added to a warming trend. Twenty-one adjustments were trend-favourable while eight were unfavourable. So, by number, 73% of the ‘corrections’ favour an upwards trend. The trend-favourable moves (time-weighted) sum to 120.3°C whilst 16.2°C go the other way. So, by impact, 88% of the ‘corrections’ favour an upwards trend. Graph of NIWA’s latest adjustments, showing the linear trend – courtesy Bryan Leyland. Click for larger version. The graph shows the adjustments prior to 1974 are not only uniformly negative but also virtually linear with time, becoming greater the older the data. 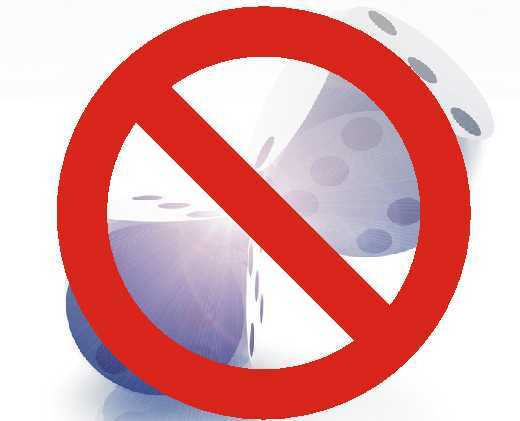 What could be less random? Let’s all ask ourselves that question. The ~ 0.5 C downwards adjustment at the start of the series is bizarre. Seeing this before and after makes a great deal of sense to me after looking at temperature records prior to 1909. From what I’ve compiled by averaging Albert Park and Leith Valley back to 1887, temperatures were much warmer 1887-1909 than 1909-1950 adjusted 7SS. Splicing 1887-1909 data to unadjusted 1909-2009 7SS would result in an almost flat trend with y intercept 12.4 C. So much for 0.91 C/century warming. BTW has anyone credible (Hessel?) compiled a series that extends back prior to 1909? Pre 1887 gets messy with station changes and I’m out of my depth at that point. Pingback: Climate Conversation Group » 7SS – R.I.P. The ‘official’ climate record is obviously still regarded as the Warmists plaything to do as they will with. Having delved a little into the methodology of measuring temperature, I have strong doubts that that any ‘official’ trend for the preceeding century up to the present day is actually a trend at all as the accuracy of the daily readings, for a number of reasons, may be rather more inaccurate than is generally realised or admitted. An excellent post about Metrology (the nuts and bolts of measurement) very recently at WUWT has relevant information about this..
Perhaps NIWA were just lucky? Even a 100-year flood is going to happen sometime. And, on a good day, 30-odd random site changes might all move in the same direction at just the right size and duration. Like the million monkeys on a million typewriters will eventually write the bible, enough climate scientists with sufficient computer leverage could eventually devise a curve which matches the old curve – even with a completely new set of adjustments. The second scenario seems more plausible to me. When I heard it, it wa ‘a thousand mokeys with typewriters would eventually and quite by chance reproduce Shakespeare’s collected works’ and yeah, you are as cynical about favourable happenstance as I am! NIWA have made their actions re the ‘adjustments’ look totally unbelievable…again. Why is the New Zealand 1861-1992 six station temperature series (6SS?) not part of NZ records and the actual data (not anomaly) available as NZT7 is? I’ve been trying to find data for NZ temperature 1860-1910 to determine whether NIWA’s 0.9 C/century 1910-2010 is of any relevance and it has turned into a revealing exercise. IPCC AR4 WGII references “NIWA 2005” which is on the NIWA website as “Past Climate Variations over New Zealand” and 1C warming 1860-1990. That page shows warmer periods than present 10,000 and 140,000 years ago but the relevant part is “Climate variations over the last 140 years” that says “In the New Zealand region (T3) the magnitude of warming between the decades 1861 – 70 and 1981 – 90 is 1.1°C”. This is the figure that AR4 cites (1 C) but note that 1991 and 1992 data is available and significantly cooler than the 81-90 decade i.e they could have used 1983 – 92 if Salinger had used the data available to him..
That data is obtained from “Southwest Pacific temperatures: trends in maximum and minimum temperatures”, Salinger, 1994. The 6SS annual mean anomaly is plotted in Figure 2. It is in Table 1 that the 50 yr changes 1941-1990 obtained by linear trend are tabulated and 1991 and 1992 are ignored. Instead, the 5 decades 1941-1990 are used to achieve a 50 yr rise of 0.77C. Salinger could have used 1943-1992 but that would be a lessor value than 0.77C. For the New Zealand group 3 (T3) “Six New Zealand sites were selected with high quality records and no known anthropogenic influences” for an 1861-1992 series. Why is this 6SS not included in New Zealand’s temperature records and the actual temps available? The mean temperatures are plotted as an anomaly from 1951-1980 but there is no linear trend over the entire series. Instead the data is smoothed by gaussian filter which is more representative than NIWA’s current practice of applying a linear trend to NZT7.. It is clear that the NZT7 linear trend should not be applied as is done on NZT7 because 1861-1940 is relatively flat and may even be a negative linear trend. Also 1890 shows a significantly cool period relative to 1910 but plotting an average of Auckland Albert Park and Dunedin Leith Valley from CliFlo shows 1890 significantly warmer than 1910. There was a rapid rise 1945-1955 that accounts for 0.6C of the 1C that AR4 cites (probably less if 1991 and 1992 were considered) and clearly a linear trend 1861-1992 would yield a per century trend much less than the 0.9 from NZT7. My estimate, 0.5C/century. The observed series shows 1890 warmer than or equal to 1910 and the reconstruction shows a warm phase in the 1830s that was warmer than subsequent years up to 1980 (noted in the text). Which tends to contradict the 6SS over 1890-1910, confirms the use of an Auck/Dunedin average to ascertain 1887-1910 temps and extending the observed temperatures back to 1850 makes the 0.9C/century trend from the NZT7 even sillier..
Back to AD 1720 Using Libocedrus bidwillii Tree-Rings. Plotting this data and applying trends should be interesting. I’ve plotted the data from Xiong, L.; Palmer, J.G. 2000. Reconstruction of New Zealand Temperatures Back to AD 1720 Using Libocedrus bidwillii Tree-Rings. Now to find the data for Salinger’s 1861-1992 series and the other un-sourced 1850-1980 series. Yup, pretty much what I’d agree with. The unadjusted Salinger 7SS had just less than 0.3ºC/century for the last 100 years, from memory. This fits well with the agreed view that NZ should show warming rates similar to SH ocean trends. The two observed series are in good agreement around 1900 on closer inspection, both show a pronounced cool period about 5 years and both show 1890 and 1910 at similar and warmer levels. I misread the Salinger plot first look..
EMD trend from observed data 1887-2010, +0.26 C/century. This is only 0.03 more than the Feb-Mar tree ring reconstruction for a similar period. I extracted the EMD trend by extending the 7SS back with an average of Auckland Albert Park and Dunedin Leith Valley from CliFlo. The plot looks a little like Salingers but doesn’t have the pronounced cool period about 1900 and 1890 is generally warmer than 1910 by about 0.4 C.
I really do not think the downward adjustment to early 7SS data is warranted given the CliFlo data 1887-1910. Is this a peer-reviewed journal-published paper obtainable from the NOAA website? And does it discuss a study of tree rings showing that the NZ warming trend 1910-87 was only 0.24°C/century? If so, it would appear to contradict the NZT7 (and 7SS). I don’t know the details of the peer review process at that journal. Note that the results are for Feb – Mar. I averaged the two to enable a simple plot to apply linear trends myself, so although it is a temperature reconstruction, it does NOT say anything about trends in the abstract, that is my compilation. A citation is also required for use. Using my method to extract the 1910-1987 trend certainly contradicts NZT7 and 7SS but I think a better comparison is with a compilation of observed NZ temperatures from 1887 rather than 1910. I’m putting together a post for Richard Treadgold with more detail that everyone can address. The IPCC cites NIWA 2005 and a 1 C rise which is actually obtained from Salinger 1995 “Southwest Pacific temperatures: trends in maximum and minimum temperatures” in which he compiles a 6SS 1861-1992 from observations but I can’t find the data for his plots. My solution is to use data from CliFlo to concatenate to the 7SS in order to obtain a 1887-2010 series which yields trends similar to the tree ring reconstruction. I will put the full story including the IPCC-NIWA citation in the post for Richard T.
Interesting that the IPCC cites values from Salinger 1995 but the only way I can think of to reproduce his 6SS plot is to estimate the data points from his plot. 3rd showing my compilation of the 1720-1987 tree ring plot. The two adjustments I can imagine that make the older records warmer than if they were made today is time of measurement and equipment. But neither should be linear. If we take measurements earlier than we did – I’d like to see proof – then there would be a step change. Previous scientists (amateur or not) recognized the need to hold to a protocol such as when the temperatures were measured. The equipment that was used may have read “warm” – I’d like to see the data on that – but again there would be step-changes as technology is not a slowly moving thing. The only truly slowly progressive change is for the Urban Heat Island Effect. And that should push modern readings down, with no effect or minimal on the oldest. All this strangeness available to those with an Excel Spreadsheet. Doug, email me here at rscumming@gmail.com and I’ll send you a Word doc report on this if you want. Andy, I’ll send you a copy. Bob has moved on to Lincoln and Gary is looking at interpolation infill and cross-correlation issues. That’s a very good point about step-changes. Pre-smoothing, the graph should jerk up and down as site changes occurred at random intervals for a host of different reasons. The most obvious reason for a long continuous warming curve would be UHI at several stations. Hessell refers to an “urbanisation index”, which suggests that urban stations can be expected to warm in logarithmic proportion to population growth. As urban effects have been measured in towns with population as low as 2,000, virtually all of the 7SS stations have probably been affected. (Perhaps Lincoln could be classed as “rural” – although it is only 15km from a major metro area). The other cause of warming trends (as opposed to step-changes) is growth of foliage which shelters the thermometer site. This issue is singled out for mention in metadata relating to Auckland, Wellington, Lincoln and Dunedin and obviously can’t be ignored. Both of these factors are artifacts of the measuring system, and have nothing to do with any general NZ warming.